Winter is prime time for catching lake trout, but finding and hooking these tough, aggressive fish can be a challenge. Understanding the best techniques and baits plays an important role in success. If you want to catch more lake trout through the ice this winter, follow these five tips, which have been proven to hook lake trout on a consistent basis. It is important to remember that lake trout like deep water. This could be 20 feet, 50 feet or 70 feet, depending on the body of water you are fishing. Whatever the depth, they are often found at the bottom, typically near some type of structure. But lake trout often cruise at various depths when looking for food. They could be 4 feet down in 30 feet of water or 15 feet down in 20 feet of water. Having a fish finder can be extremely helpful in locating lake trout. Look for lake trout near deep humps, off points or near rock piles. You can also find them near schools of baitfish, especially were deep water meets shallow water. Lake trout are continually on the move in search of food. So if you try one location and cannot find any fish or if you find fish and the action suddenly stops, get up and move to a new location. 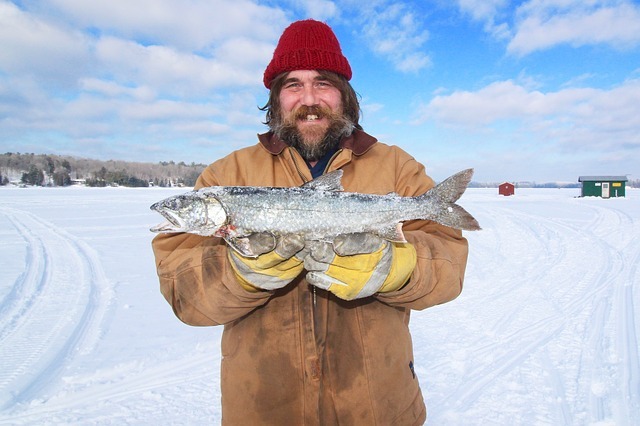 Ice fishing for lake trout requires you to be mobile and willing to move often to find fish. A good tactic is to map out a dozen or so locations with good potential, before you start fishing. This way you will be prepared when it is time to move and you will not waste time figuring out where to go next. One of key elements to catching lake trout is sound. No form of attraction travels more effectively in water than sound. Lake trout are aggressive and will chase sound, rising 20 or 30 feet from the bottom to pursue it. Any rattling bait, especially those that imitate whitefish or ciscoes will work well. Jig your baits at different depths, keeping the bait moving and emitting sound. In addition to sound, flash is one of the most important attractors for lake trout. Flashy baits, especially those that have a rattling sound are deadly for lake trout. Spoons are another effective choice. Lake trout have very good eyesight and can see the flash from a bait, from a significant distance. Their aggressive nature will prompt them to investigate the flash from your bait. When other baits do not seem to be working, try live bait. Sometimes the movement and smell of a baitfish can be the little extra you need to encourage a lake trout to pull off the bottom. Some of the best live bait for lake trout includes chubs, suckers or shiners. For added attraction, hook the baitfish to a jig. This will provide extra action that could entice a hit.